Unblock-Us is a well-known Smart DNS provider for unblocking geo-restricted content for smart TVs, subscription-based video-on-demand (VOD) and numerous online channels, including sports, music and radio streaming services. Its European headquarters are in Cyprus while its worldwide operations are run out of Barbados. 200+ channels can be unblocked with Unblock-Us Smart DNS, including major and less well-known sporting events around the world, numerous subscription sports passes, VOD services, online TV, kids programming and a plethora of music and radio channels. 200+ channels can be unblocked with Unblock-Us Smart DNS, including major and less well-known sporting events around the world, numerous subscription sports passes, VOD services, online TV, kids programming and a plethora of music and radio channels. Unblock-Us provides access to hundreds of online streaming services including Netflix, HULU and BBC iPlayer. VOD/streaming services include Netflix, Hulu and Hulu Plus, Amazon Instant Video, HBO GO, Now TV, CinemaNow, Blinkbox, Funimation and numerous others. Online TV channels include BBC iPlayer, Channel Four’s 4OD, SkyGo, ABC, FOX, Showtime, Bravo, Comedy Central, CNN Go, Canal Play and many other channels from around the world. Kids TV channels on offer include the Disney Channel, Marvel.com, Sesame Go and more. Major music and radio services include those offered by Spotify, Pandora, BBC iPlayer Radio, Slacker, Rhapsody, MTV, Radio.com and several others. Sporting events include the National Rugby League, Major League Baseball and Major League Soccer. Sports pass access includes the following major channels: NHL GamesCenter Live, NFL Gamepass, NBA, BBC Sport, ESPN, Sky Sports (through SkyGo), BT Sport, UFC TV and many more. A comprehensive and categorized list of available channels can be found on the channel section of the Unblock-Us website. What’s more, each channel subsection includes a wealth of additional information, including supported devices with handy icons, available regions, subscription details, payment methods and website links. There is also a useful ‘On Now’ status for events currently being broadcast, as well as a ‘New’ status for recently added channels. Unblock-Us can be configured on many operating systems, including Windows XP, Vista, 7, 8 and 10 and Mac OS X; consoles such as PS4, PS3, PSVita, Xbox One, Xbox360, Wii and Wii U; the following Smart TVs and set top boxes: Sony TV, Panasonic VIERA, Samsung TV, LG Smart TV, Apple TV, Roku, Google TV, Boxee Box and WD TV Live Devices, as well as handheld devices including iPhone, iPod, iPad, Android and Amazon Kindle. Setting up Unblock-Us Smart DNS on Windows 7 is straightforward, requiring a simple alteration in the network settings. 1. Once you’ve signed up for the service, or if you’re just testing Unblock-Us out using the free trial, open your Control Panel and click on Network and Internet. Then click on Network and Sharing Center and then on Change Adapter Settings. 2. Now you’ll see your current internet connection, either Ethernet (LAN) of Wi-Fi. Left click on your connection and then right click to bring up the menu, then click on properties. You will see a list of checked items. Uncheck the box that says Internet Protocol Version 6. Then left click on Internet Protocol Version 4 and open Properties. 3. In the General tab. Be sure not to change any of the top half of this window (where your IP address details are stored), we’re only changing the DNS settings in the lower half. Click on Use the following DNS server addresses. Now enter the enter 208.122.23.22 in the Preferred DNS server field and 208.122.23.23 in the alternate DNS server. 4. Restart your computer. Once loaded up, open the Unblock-Us homepage. You should see 3 green bars towards the top of the page confirming that each of the three steps has been completed, which means you’re ready to go. You can use the ‘Netflix Region Picker’ underneath the third green bar to update your region. Remember to jot down your current server addresses/settings before changing your DNS settings just in case you need to revert to your default settings. 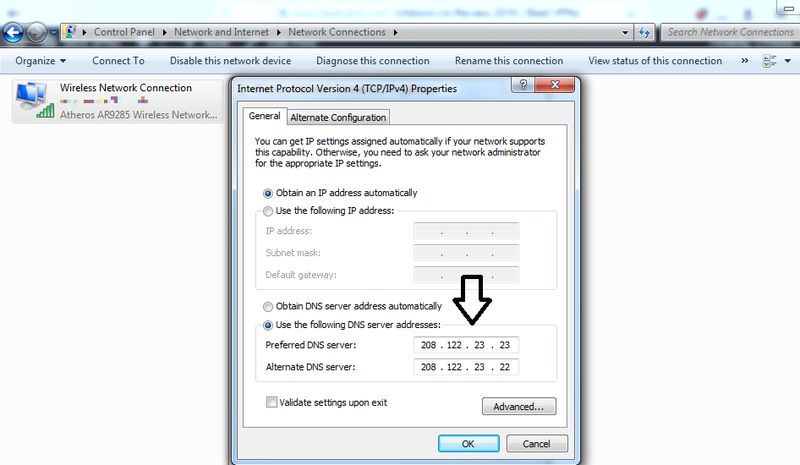 For more details see our guides for Smart DNS set up for Windows and for Mac. On the Unblock-Us website there is a ‘VPN’ section though there isn’t a VPN service as such (as far as we can tell). At the time of writing, there isn’t any actual traffic re-routing via a VPN server and users who are looking for high-level encryption should consider a dedicated VPN service. Unblock-Us is still, however, a solid option for Smart DNS geo-unblocking. Unblock-Us also has a comprehensive support section on its website with clear and detailed sections, service updates, FAQs, set up guides as well as a blog and a public forum on which you can post questions and add comments. There is also a useful ‘How to Setup’ section on the website that offers specific guides with video tutorials and screen shots for a wide range of operating systems, consoles, smart TVs and handheld devices. The device on which you access the site is automatically detected. Email support is also available and operates 24 hours a day 7 days a week. When we tested the email service, the provider responded within 15-30 minutes with detailed support. Users can send an email through the integrated messaging system on the support section of the website. Aside from the message itself, users can indicate the device and internet connection in question and can also attach files if necessary. Currently there isn’t a contact telephone number or a live chat option, which would be nice to see. Subscribers can pay for Smart DNS at the monthly price of $4.99 or a one-off annual sum of $49.90, which effectively gives you two months for free. If you’re not sure about Smart DNS with Unblock-Us, since there are a lot of Smart DNS providers on the market, Unblock-Us offers a 7-day free trial that does not require users to enter credit card information and there is no obligation to sign up after the trial has ended. At present, the only accepted payment methods are Visa, Mastercard, debit cards and PayPal. Anonymous payment methods such as Bitcoin and Litecoin are not available and after probing the support section it seems there are no plans as of yet for their inclusion. For the monthly subscription plan, subscribers are not entitled to a refund for any unused portion of subscription though cancellation is allowed at any time. If you’re thinking about cancelling, it makes sense to do so before the start of the next month’s billing cycle, so you’re not charged for a month you haven’t used. According to the provider, refunds will only be given in exceptional circumstances and at the ‘exclusive discretion’ of Unblock-Us. For annual subscription, you are entitled to a full refund, providing you voluntarily cancel your subscription within 30 days of purchase. Again, exceptional circumstances may result in a refund but only at the discretion of the provider. The Unblock-Us website is generally straightforward though a little sparse when it comes to details about payment methods. Despite this, most questions relating to payment, billing and service can be answered using the search function on the Support tab. I am in Shanghai, China now and using PureVPN. It seems to work great here I would highly recommend the use of it. I am another disgruntled Unblock US customer after the Netflix DNS crackdown. Other providers are finding ways to overcome the blocks or telling customers that they’re working on it. These shysters took a year’s subscription money from me in Feb ’16 and now are refusing to offer refunds now that their “service” no longer works. They pretend everything is OK and don’t even have the decency to mention the issue, while still signing up new unsuspecting customers. They aren’t even trying to find a fix, after all they’re still scamming customers out of their money. They are scam artists, as others have stated. I am now looking for a workaround to the Netflix blocks and will sign up with a different provider if needed. The service hasn’t worked for weeks, support no longer responds. Looks like Netflix has permanently blocked this type of service but UnblockUs refuses to admit that and is still advertising their service. Contacted support over 2 weeks ago with still no reply. very unhappy with this service. Hola is a free service and provides access for all their customers. what a joke that we pay and they cannot even keep up with the freebies. Looks like the same case with me. Their support used to have lots of info on NetFlix but a search now will yield nothing. They took my money for a years subscription, now their service has been invalidated by Netflix and with 9 months left remaining they won’t give me a refund on the service they bill me for but can’t provide. Scam artists. Pretty disappointed with this service. Worked fine until the ‘crackdown’ on proxies and unblockers. The solution provided worked insofar I’m able to watch one movie before getting blocked again. Let me tell you that resetting the DNS settings after every movie gets really old really fast. Tech support responds with the same canned message over and over again. I’ve been using Unblock-Us for a little over a year now and thus far have been pretty happy with their service. I don’t change regions often, which might raise flags with Netflix, so I figured I was pretty safe from the “cracking down” they were doing. I was wrong. Yesterday I had my first run in with Netflix cracking down. I went to watch my favorite TV show, not available in my country, and was met with the dreaded “Proxy Detected” screen. When I contacted unblock-us it took several hours before I received a reply because they were having a “high volume” of support tickets being submitted. That reply, sadly, was a canned response, they send to everyone who’s having connection issues. The support message I received contained steps to gather various connectivity information, so they can have more details on my connection to various services, as well as basic troubleshooting steps to perform if the issue had been on my end. Being a network administrator myself, I already knew the issue wasn’t on my end so I pretty much ignored the support message and decided instead to pass the time watching some YouTube. Several hours later I checked back and found that Unblock-us was once again working, as my Netflix was once again working. I’m not exactly sure how long it took for them to correct the problem, but it was corrected and that’s what matters. As for how I feel about Unblock-Us, it’s kinda mixed. After this experience I’ve gotta say that I’m really not a fan of their support department. I think “canned” responses to customer inquiries is a fairly horrible way to treat someone who’s paying for that support. On the other hand, it would appear their technical department (behind the scenes) is very quick responding to problems and getting the service back up and running. Taking my year of uninterrupted service into account, if I had to give a rating to Unblock-Us, I think I would highly agree with this reviewer and offer a solid 4/5. The initial setup was easy, their support pages are full of information if you actually are having issues on your end, changing regions is painless, and outages seem rare.